Three Northwestern students will present their research at the Upper Midwest Region Honors Conference April 24–26. Northwestern College students and professors will present their research at the Iowa Academy of Science’s 126th annual meeting April 11 and 12. 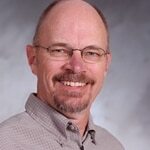 Dr. Byron Noordewier has been named the 2013 Wally Schwartz Faculty Athletics Representative of the Year by the NAIA. NWC professors Laura Furlong and Jeff Barker will receive Endowed Research Fellowships. Two Northwestern faculty members have been awarded sabbatical leaves for research projects. Dr. Zuhair Fathallah, assistant professor of plastic surgery at Basrah Medical College, will speak in chapel on Monday, Sept. 30, at 10:05 a.m.
Northwestern College has welcomed five new faculty members to campus.